Practice started yesterday for the 101st Indianapolis 500, and I know there will be a bit more interest on the forum this year with the presence of Fernando Alonso. Juan Pablo Montoya, Takuma Sato, Sébastien Bourdais, Alexander Rossi, and Max Chilton are also in the field. Practice streams every day this week at racecontrol.indycar.com (it's a YouTube video). Time trials (what F1 would call "qualifying") take place this weekend. Yesterday, Alonso was fastest in Rookie Orientation. The orientation includes the refresher course for drivers who do not race regularly in IndyCar, so he was not just faster than all the other rookies, but faster than a lot of experienced drivers, like Oriol Servià (who has been racing Indy-style cars since 2000), Jay Howard and Sebastián Saavedra. None of those three are going to be the headliners, but it's a start. In practice proper, Alonso ended up 19th. 32 cars took time (Buddy Lazier, 1996 winner, is on a "short program," which means he doesn't practice the full week). And, as ever, I made a "Delta Force" intro for this year's race. These teasers were done by Paul Page in the late 80s/early 90s, and then revived by Al Michaels. The last one was done in 2001, I believe, though Page did some on radio afterward. Just because a current F1 driver is involved does not make it any more relevant to this site. If the site subject is now so tenuous - I look forward to updates on Golf, Triathlons and celebrity soccer matches! We actually have the most interesting F1 season for many a year, yet all I ever read is how much every loves or hates a driver for a low to mid table team. While I agree with you that this forum's quality of discussion is pretty rough, you may not have noticed this thread is in a subforum called "Outside the F1 Circus," rather than the main subforum, "F1 Discussions." So, the site subject is not tenuous...this section is specifically for auto racing that isn't F1. I was counting on your knowledge and communiaction skills to let me understand a little better the intrincacies of Indy. I watched practice today (every now and then). I found it strange that a country that loves on screen statistics and figures so much, practice was strangely devoid of any indication of speed or lap times, or the driver's preferred sock color. I am hoping that watching Alonso at Indy will be the incentive I needed to finally grasp American motorsports. I always liked that Hélio Castroneves guy. The guy is named "Helium" for christs sake! BTW, how "Satoish" is Takuma's driving style in Indy? Oh, and yes whatabunchofrednecksandhillbilliesdrivingincircles! F1 is where class is at. I am getting that picture of Michael as a tattoo on my back. Oh my gosh. The racecontrol.indycar.com page has both the YouTube stream and the timing and scoring below it. If you just watch it on YouTube directly, you won't see the times. It's low-budget. Now that's a guy that brongs all his knowledge and experience from F1 to Indy and gives it freely. Good for Takuma! Thanks for the tip. Watching the YouTube stream was as fascinating as watching a 6-hour documentary on Ron Denis' favorite socks and shirts. It's dull even with the timing and scoring, which is pretty basic. I love the Indy 500 more than any sporting event, but the truth is that oval racing has always been more about racing the competition than racing the track (road racing being the reverse). And so if cars are out on their own or running in separation on a circuit, it's still fun to watch because there's a challenge. Running alone on an oval is not a great challenge. Now, it used to be a bigger challenge at Indy, and that made practices fun because you'd have a ton of incidents (not that I enjoy wrecks, but there was a big drama to it—sometimes, a team would end up having to withdraw, or piecing together the hilarious thing pictured below). But since 2012, they've used this same basic chassis (in 2015, Honda and Chevrolet were allowed to design their own "aero kits" to put on a common tub), and that chassis has been very, very stable. You don't see more than one or two incidents in practice or qualifying anymore. The upside is the races have been largely green, which makes them go faster, but also keeps the strategies alive. Practice was also more fun in the years when, economically, more cars could show up. The thing was, you'd have 40 cars entered for 33 spots. So, then what would happen is by the end of the week (today), a team that didn't crash any cars in practice would say, "Heck, let's enter our T-car (spare car)." And by Sunday time trials, they would've pieced that together, found someone with a helmet, and tried to bump their way in. So, practice was hilarious because there'd be all kinds of speculation and rumors about, "I saw this guy talking to A. J. Foyt" or "that driver's waiting." Now, Chevrolet and Honda both cap their engine supply at 17, so no more than 34 cars can enter. This year, Chevrolet got nowhere near 17, so there are 33 cars for 33 spots. Alonso so far in the top 5 and ahead of Marco Andretti. Should I be impressed? I think so. Still more amazed that Bourdais is still a glass cannon. Edit: out of respect of Bourdais, who seems to have multiple fractures. Hope he gets well soon. All accidents in indy seem horrific, yet everybody seemed to be ok, I thought this was the case too. Ovals are made for overtaking. The folks that somehow require that of F1 should enjoy Indy, if only because of that. Plus those guys qualify at some 30% the speed of sound. 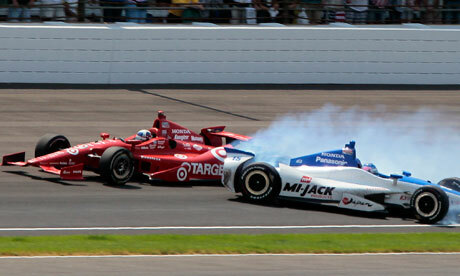 The Bourdais wreck is a lesson to any rookie who hasn't crashed at Indy yet: don't try to save it. When you lose it, you lose it. Saving it is how you end up nose-first into the wall, and that's a really bad way to crash. I am by no means implying Bourdais hit head-on because he tried to save it (still unclear if something broke), but the point is that trying to save it is one way to have a Bourdais-like wreck. Bourdais is lucky in a ton of respects, some by design. After James Hinchcliffe's leg was impaled by a suspension piece in a similar wreck, IndyCar added anti-intrusion panels to the cars. Hinchcliffe was moments from bleeding to death (not a dramatization—I forget what the doctors said, but it was measured in seconds. Got his artery). Thankful that the panels worked. (1) Look at all the parts and pieces that fell off the car. The biggest risk in IndyCar is still not this wreck—it's being hit in the head by the horrible debris from these wrecks. No series needs head protection more than IndyCar. (2) Another car striking Bourdais' wrecked car in the side, which is possible in the tight packs of oval racing, has the potential to be a Paul Dana or Alex Zanardi situation. While the modern car is better for being T-boned than the cars of those (fairly recent) days were, once you've already hit the wall, you've compromised all the protection around you. Note he was missing a sidepod and the nose; being struck there by another car could be disaster. Now, this wreck is less likely to happen in a race because they'll run with far more downforce at much lower speeds, so the cars are a lot less sensitive. But every year, the hope is that it won't, because the chance is there. The question is now what happens to the Dale Coyne #18 entry. They just added GEICO to the sidepod, but they're in a tight spot. Although Bourdais won a race this year, don't be fooled—this is the lowest of low budget teams when it comes to the full-time cars (some of the one-offs are lower budget). Mikhail Aleshin caused a big wreck at Phoenix that damaged one of Coyne's cars, and he's already running an extra entry for Indy (Pippa Mann). This chassis is likely totaled, never to race again. And Honda engines are in short supply as more teams are running Honda than Chevrolet, and it's not clear that the one in the car can be saved. This puts humongous financial pressure on Coyne's team and really strains the resources. Yet a full field is 33, which is very important to Indy (to the point the Speedway funds entries to hit 33—Fernando Alonso's car is actually funded by the parent company of Indianapolis Motor Speedway, Hulman & Co. That's how he got the ride; Hulman was originally paying for Stefan Wilson, brother of the late Justin Wilson, to run a car promoting their partnership with the Indiana Donor Network, as Justin was an organ donor and saved seven lives through that when he died. But then Hulman saw an even bigger opportunity with Alonso, and moved the Wilson program to Jack Harvey). So, what to do? No decision has been made by Coyne, and the rules technically state they must attempt to qualify today, but I imagine it'd be waived to get to 33. Coyne's only backup car is a road course car that Bourdais drove in the Grand Prix of Indy last weekend. That will take a ton of work to convert to an oval car (the entire aero kit is different), and they'll likely need spare parts from other teams. Moreover, they'll be hideously slow with a converted car, which GEICO, expecting to contend for the win (Bourdais was fastest Friday and could have won pole with the laps he was doing), will not like. Some drivers are around: Stefan Wilson being one (and in Honda's good graces for allowing Alonso into the #29) who drove for Coyne, and spotted for Coyne when Justin Wilson drove this exact car. James Davison, who has also raced with Coyne, is there. Townsend Bell, who has been very fast at Indy but is crash-prone year after year, may be an option, but too risky for a team barely piecing it together. Tristan "The Vulture" Vautier, yet another ex-Coyne driver, visited the garage after the wreck to offer his services while anyone with decision-making authority was at the hospital. This is a small team and the car for the 500 will likely be pretty bad, if it races. But they have an incredible engineering and strategy staff, including Craig Hampson, who won four titles with Bourdais, took Oriol Servià (a bit of a journeyman driver) to fourth in the championship in 2011 with a great year, and helped Andretti Autosport a ton when Honda was the weaker package than Chevrolet. It's arguably the best team besides Andretti, Ganassi, and Penske, despite also being the smallest full-time squad. It's a huge opportunity beyond Indy for someone. Then, there's just the heartbreak for Bourdais, who will miss both the Indy 500 where he seriously had a car good enough to win and Le Mans, where his factory Ford should have been a factor for a GTLM class win. Le Mans, of course, is where Bourdais grew up. This is the best situation Bourdais has been in since Champ Car in 2007; after, he went to Toro Rosso and his career came undone. But he's slowly pieced it back together and gotten back to some of his best IndyCar wins ever, which says a lot for a guy who won four straight titles. He hasn't gotten a big drive since coming back, but was in a tremendous situation this year, reunited with Hampson for the first time since 2007. And finally, there's just the irony. When Bourdais first returned to IndyCar after the F1 failure and his focus on sports cars, he did not run the ovals (though he had won oval races in Champ Car). Too dangerous; had children. He was eventually persuaded back. At 38 years old and with serious injuries, one wonders if he'll recover enough to drive again, and if he does recover, if he'll want to drive again. It's too soon to know, but no one would be shocked if, assuming a full recovery, he stuck to trying to get Le Mans. Slow motion seems to show counter-steer, small at first and then all out. It could still be a malfunction but it would be a weird one. Well, that qualy session was the most exciting thing I've seen in motorsports in the past 2 years, at least. Alonso 5th, of course! But also Sato! Rossi! Crazy stuff. I like it that there seems to be a good buzz among F1 and Indy fans and journalists so far (haters are part of the folklore, but the general atmosphere seems great). Hopefully there will be more of this. I'd like to watch Hamilton, Vettel or Ricciardo, I bet they would be something special (not to mention Verstappen!). And of course it would be great if FIA could find some way of letting Indy car drivers give F1 a try. I think Helio Castroneves was close to a switch with Barrichello once. Alonso asked if he was nervous with engine problem: "I'm used to changing engines before quali and the race!" Rossi: "It's your specialty!" Indy 500 qualifying always amazes. On paper, single-car runs on an oval sounds not very interesting, but with the downforce taken out, the drivers are absolutely pushing it to the edge, and it's visible. Sato slapping the wall and never lifting was quite the spectacle. Rossi was really fighting for it, too. Alonso did a much cleaner run today than yesterday. I love this race so much (obviously). It depends how the cautions fall out, but if it isn't about fuel strategy (which is always very dramatic and fun, IMO), the final stint becomes about who can trim out the most. Basically, the closer you can run to your qualifying setup in the last few laps of the race, the better off you'll be. That's really where the driver comes in—some drivers are just better than others at driving a car with no grip. I have my favorites, but ignoring that for a moment, a battle between an IndyCar legend like Dixon or Castroneves and Alonso in the final laps would be magic. 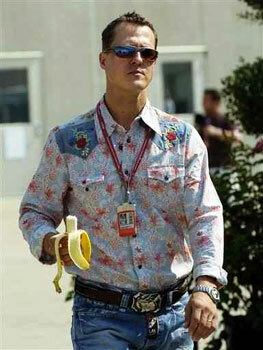 But I'll be pulling for something a little different, as a biased fan of "my" drivers. Wasn't fuel strategy what gave Rossi last year's victory? Look at that, geez, the man is leading on lap 38. That's just nuts. That was one violent crash. The slow motion is incredible. Castroneves drove under Dixon's flying car. And that was that. Can't remember the last time I watched an oval race. Fun stuff... and home victory. Not bad at all. Good race. I had not watched an Indy race in a couple of years because of other things on my schedule. It was impressive how good Alonso was. He clearly understood the car, the settings, how to draft, how to pass, etc. He was clearly one of the fastest men on the track, although he probably would not have won the race if he had lasted. Still, it was a good drive. It was clearly going to be an Andretti car (there were five) that was going to win....kind of weird that It was Sato. I enjoyed the race a lot, but I don't think it was ever an option for me not to enjoy it when the Indy 500 is just my thing. Fernando Alonso will never do a full IndyCar season, of that I am sure, but he really would be something in this series. It's so hard to win the Indy 500 in a one-off—it rarely happens, and some great, great drivers have tried it (albeit usually later in their careers). I hope he'll at least be back to this race again. It sounds like he plans to be. Well, back in the day when the series was stronger (read: CART)....there was Mario Andretti, Emerson Fittipaldi and Nigel Mansell in the series....and it was regularly sending drivers over to F1 (Michael Andretti, Juan Pablo Montoya, Jacques Villenueve, Alex Zanardi, Sebastain Bourdais, etc). A little more cross-fertilization would be nice. Good to see Fernando there and hope he comes back for a race or four.